"Die Einspielung bietet alles, was man sich als Freund guter Musik wünscht: emotionalen Tiefgang, Leichtigkit, Virtuosität, an der richtigen Stelle aber auch bombastischen Sound. Europa kann so schön sein..."
"Mir fehlen die Superlative, um dieses Musikerlebnis angemessen zu beschreiben. Phänomenal! Unbedingt anhören!" "The energy and drive are palpable, the precision at times breathtaking, and the control of tempo and dynamics something to marvel at. (...) Undoubtedly the EBE is a crack ensemble, with much to enjoy throughout this CD, and plaudits of course to Thomas Clamor." 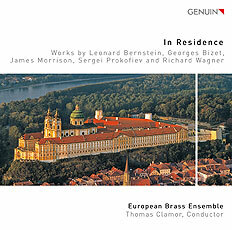 "As is consistently true with Genuin, the sound is state-of-the-art: clean, bold, and open, showing off the ensemble’s potent low brass, blazing trumpets, resonant horns, and incisive percussion, but just as effectively revealing the subtle balance and kaleidoscopic color of these outstanding musicians." "Blechbläsersound vom Feinsten (...) hervorragende, gestochen scharfe, rhythmisch präzise Musik, es entstehen Klänge mit viel Energie und Dynamik; höchstes Niveau"